Social Media Engagement is the key to a successful campaign and there are a few aspects that you should take into account when you create your Social Media Strategy and your content. The main goal of Social Media Marketing is to produce content that users will share with their social network to help a company increase brand exposure and broaden customer reach. It’s easier said than done, but, if you are new to all this, you have probably noticed that you shared what you thought it was good content without getting results. 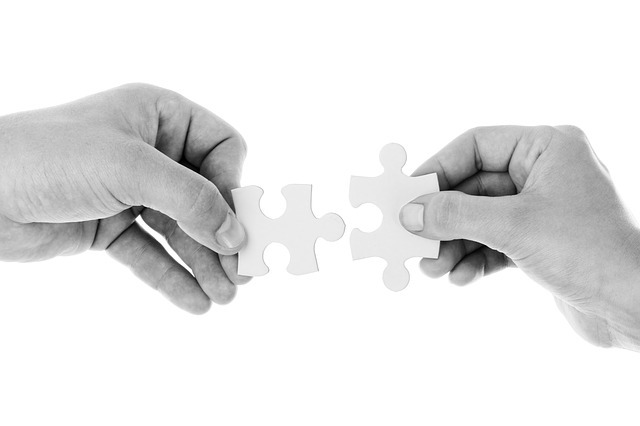 Social Media Engagement means interaction between people and brands on social networks. 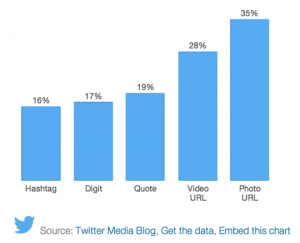 On Facebook, engagement includes likes, comments and shares, while on Twitter are likes, mentions and retweets. To get the most from your social media campaign, learn as much as possible about your target market: preferences, background age and so forth. Make sure you know when on social media they are hanging out and why. If they use Facebook just to connect with family then there is no need to be there. On the other hand, if you know they use Twitter to read news, for example, create more newsworthy content. If your product or service appeals to one or more identifiable demographics, you can create content that appeals specifically to their tastes. Create ‘Buyer Personas’ to help you identify your ideal customers.You will find it easier to create the right content if you who is going to read it. Find useful information worthy to be shared on social media. 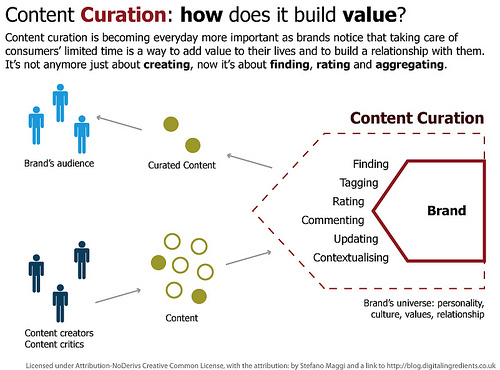 Content curation is the act of discovering, compiling, and sharing existing content with your online followers. This is becoming an important tactic to maintain a successful online presence. Not only that, but content curation allows you to provide extra value to your brand’s audience and customers, which is key to building those lasting relationships with loyal fans. If you want a more comprehensive, algorithmically generated digest of news, feeds, and content to curate, try Scoop.it, Feedly or Storify. There are many other but these are some that I tried occasionally. You can also use Twitter Lists to organise your followers by the type of content they share or by the industry for example, and, in this way, you will be able to see relevant content shared by the people from that list. Here is a blog post I wrote about Twitter Lists if you want to find out more. Tagging other users makes conversation easy and sharing more likely. When you share someone else’s content, remember to tag the original publisher. Not only that you will attract his attention and get a thank you, but he will most likely retweet or share your post. If you use Twitter, you can tag up to 10 people (tagging doesn’t affect the 140-character count on a tweet). Intriguing and engaging titles can be your company’s best friend on social media, whether in your tweets, posts or YouTube videos. Enticing titles or headlines make your followers want to click on your content learn more about what you have to say. Make sure you give your content a good headline. Ask questions that your readers will want to know the answers for. Choose words that resonate with readers, such as “incredible” or “unique”. When people are curious, they are more likely to read your content. Social Media is very good to create traffic to your website and you can only do this if the content you share on social media will have an attractive title to make your audience click the link, like, retweet/share. If you’d really like your followers to be really excited about your products as opposed to the competition’s, make sure you’re offering some great deals and exclusive specials. If the only place to get these special deals is through a specific social media site, the information will rapidly spread. Give them something unique, something that they can’t find anywhere else. Promote limited time offers or organise a contest. Communicate urgency in your advertisement, but give your customers sufficient time to visit your store. If the customers realize they may miss a good deal in the future, they will pay closer attention to your posts and updates. Take advantage of this fact to increase your follower count. A photo submission contest is a fun way to get the word out about people who use your brand. Offer an appealing prize for the individual who submits the most entertaining and creative image featuring your products or logo. Any photos they take for your contest are likely to get shared in their own personal networks, giving your brand exposure to individuals that might not be aware of you. Research says that using images can result in an 85% interaction rate on Facebook and increased retweets by 35% on Twitter. They have to be attractive and tell a story -The Product, The Team, Your Fans / Your Customers, Behind the Scenes when something exciting is going to be revealed soon, The Collage, The Selfie, The Action Shoot. Upload videos to both Facebook and YouTube, as well as Instagram if you have a visual business.